Feed the birds – especially in this weather! Make sure they have water! The best you can buy! Perfect for feeding all year round. The ultimate high-energy food for your garden friends. Thrushes, Robins and Blackbirds will love this feast. High quality, recent crop, aflatoxin-tested peanuts. Packed with nutrition great for birdsUse all year round in seed feeder. Good for: Almost all garden birds. Fantastic New Low Price – WAS £32.99 NOW £25.98Reward the birds in your garden with the 4kg Choice Sunflower Hearts. These Sunflower Hearts are packed with nutrition and make a great change for your garden birds. Husk free so no mess. When you start to feed the birds you’ll really enjoy all the visits. When you have lots of birds visiting though you need to check the feeders during the day as they can easily empty them. 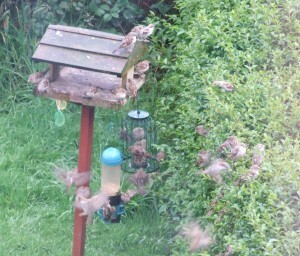 I’ve got a gang of sparrows who are doing really well at the moment but they’re eating tons of seed. I filled the seed feeder up twice yesterday. I think it’s because the babies are all learning to use the feeders too so there’s more birds than ever before. To ensure it doesn’t get too pricey you need to buy your bird seed in bulk! You can always share it with a neighbour to half the costs – or buy a mix of seeds and share that so you can attract different types. You can also start to make your own fat balls using bird seed too. Garden Bird have some great bulk buys. Our nutritionists have done it again! They’ve created this brand new and exclusive mix which must be one of the ultimate high-energy foods. Combining our previous best selling Ultiva Super Mix and Ultiva Protein Mix this new combination is packed full of the high energy and protein ingredients such as sunflower kernals, peanut granules, pinhead oatmeal and protein rich dried mealworms – what could be better? How to make a mealworm feeder and grow your own mealworms! Robins and other small birds will love eating meal worms. To be very honest I’m not sure my other half would let me use the garage for this – but it’d be something for the braver of you to think about! This site also have a range of photos and info about his bird boxes over the last few years. It’s very interesting!